Disney Nerd + Spreadsheet Nerd = Me! I work with spreadsheets all day, every day. I found uses for spreadsheets in my everyday life thanks to falling in love with them at work. The ability to organize information is key. I'm not generally a list maker or a particularly organized type of person. When it comes to Disney. I am part of a group on Facebook that is connected to my travel agent for Disney vacations. (Her name is Katie and she is awesome and you should contact her if you are thinking of going to Disney!) In a recent discussion, I happened to share that I keep a spreadsheet with many tabs when planning my vacation. My travel agent does the planning work and makes recommendations and helps me make decisions. My spreadsheet helps me stay excited about my trip, stay organized about all the different aspects of planning a dream vacation, and lets me relax more once we are officially on vacation! My organizing for Disney includes 3 important tools. The Disney website and app are a tool that I use with my travel agent while planning and also while on our trip. I use MDE to choose our MagicBands, select our Fast Passes, and keep track of all of our reservations (dining and extra experiences). While on property, I can use the app to check wait times for rides and make decisions about what experience we will head to next! I have a membership for Touring Plans. I use their Crowd Calendar to help us decide when to travel, what park to visit on what day, and to loosely plan out the attractions and rides we want to hit! I use their app while on site, too, for live updated wait time info and recommendations on what to do next. And then there is my spreadsheet. I start my spreadsheet when I first start thinking of planning a trip. It's where I keep track of quotes, resort ideas, flight options, and more. When Jeff and I went to Disney without kids in 2014, my spreadsheet had tabs for: Quotes by resort, parks plan, flight info, cost, packing list, and Garden Grocer order (this is a service where you can order stuff to be delivered to your room). The Quotes by resort tab compared the total price for the resorts we were considering - Polynesian, Contemporary, Wilderness Lodge, and Coronado. We ended up choosing the Contemporary. The Parks Plan tab has information on which park we would visit on which day, the times and locations of our dining reservations and confirmation numbers, and the attractions in each park that we wanted to visit (including entertainment and times). Flight info had details on our flights - flight number, departure and arrival times. Cost tab was my payment plan. I always pack for longer trips with a list so of course my packing list gets a tab of its own. And then info on what I had ordered from Garden Grocer - mostly grocery items like breakfast food, snacks, and toiletries. Travel Dates shows what day we fly in, what day we visit which park, what day we fly home. I've also included all the flight info on this tab. Resort Info has a Walt Disney World map that shows where the resort is located on property and a map of the resort itself. Park Plans started out as the place where I was keeping track of Crowd Calendar data from various sources, just to compare. It's really an unnecessary tab after we made our decisions. Dining is a VERY important tab! We love the Disney Dining Plan. It's wonderful to show up and basically have almost zero expenses. We bring cash for tips and souvenirs. But by using the Dining Plan, we don't have to pay every check or stress about how much we are spending on food. We get the tab, sign it, leave a tip. And we will not go hungry. For every night of our stay, we get 1 table service, 1 quick service, and 1 snack. Table service - sit down, waited on, order from menues or enjoy a buffet. Lots of character meal options with table service. Quick service - walk up to a cashier and order from a menu hung above a counter. Snacks - there are some amazing snack options that could basically count as a meal at Disney World. On my Dining tab, I keep track of when we will be using each of the table service credits, when we have our reservations booked, the quick service places we would be most interested in (I study the menues on the Disney site and read various Disney food blogs), and note any special snacks at each park. 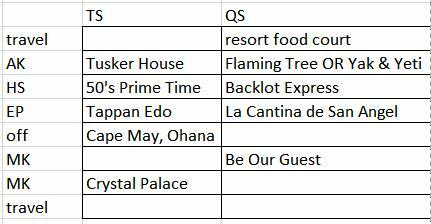 Fast Pass is where I start making lists of what attractions we might want fast passes for. Touring Plans is hugely helpful on this one - they even make suggestions of what attractions might be a good option for Fast Pass. Once i have them booked, I have them listed. Payment Plan. Once of the best parts of working with a travel agent like Katie at Hi Ho Vacations is that I book our trip with just a $200 deposit. I then have until 30 days before the trip to pay in full. And I can make payments! So I schedule it out, budget for it, and keep track of my payments on my spreadsheet. Movie Prep - I like my kids to be familiar with the characters and themes they are going to see while at Disney. I don't want them to be disappointed in not seeing the Disney things they love so I feed them certain things they will see more of before we get there. We aren't going to see Disney XD stuff too much while there. Teagan loves Disney channel shows like Gravity Falls, Jessie, Liv & Maddie and there just isn't much in the parks for these things. Here are the 2 most important things about my spreadsheet. 1. It is constantly changing. I use it to remember things, investigate options, keep track of various details. 2. Just because I keep a spreadsheet and totally overplan doesn't mean I strictly adhere to all of it once we're on the ground. The best way to have fun at DIsney is to know what you're getting into but also be able to just let go and have fun. By "over preparing" before we go, I feel like I am really knowledgable about all the options and can then make on the fly decisions more confidently. There you have it. My Disney planning obsessive spreadsheet weirdness. When I'm stressed at work, I open my spreadsheet and feel a little better. When I'm reading blogs and websites and don't want to forget a tip or packing item or snack to try, I pop over to my spreadsheet. 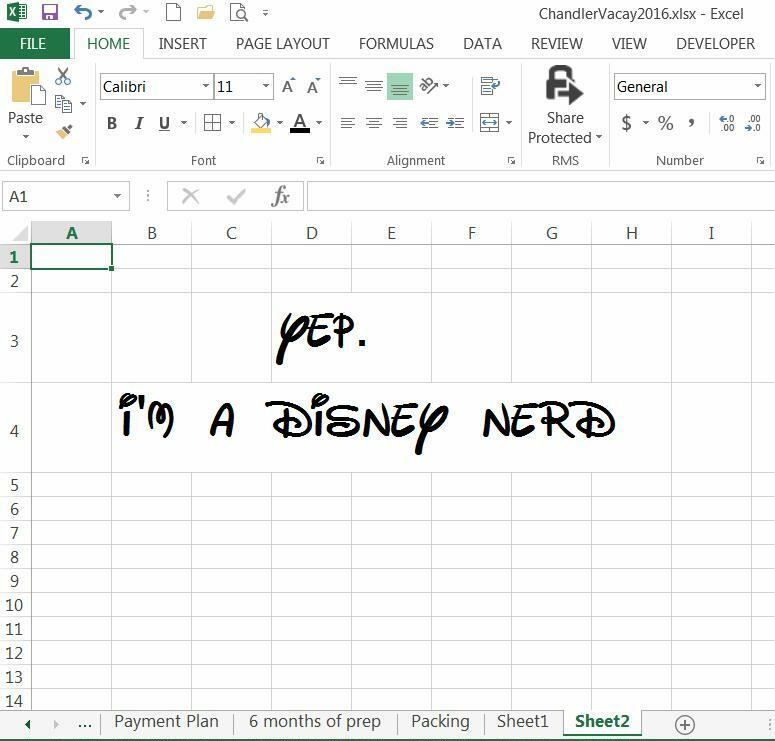 My spreadsheet is just my way of keeping track of the information overload required of a Disney vacation. It's not fancy or particularly pretty. I don't make it printable or color code it. But I do use it throughout the months of planning that it takes to really embrace a Disney vacation! Which of the following sounds more like the current state of our society, country, world? 1. Idolatry, hatred, division, envy, jealousy, anger, selfishness, contentiousness, fear. 2. Compassion, kindness, humility, gentleness, patience, forgiveness, love. Current state - 1. Ideal state - 2. Politicians. Are there are politicians who live #2? Or who at least seem to try to lead our country with compassion or humility or kindness? Sadly, I think the list of politicians seems to be full of #1's. This political season, I seem to be hearing more and more and more speeches and soundbites that are all about hatred, division, anger, and fear. What I long for are leaders who desire cooperation, cohesion, teamwork. I want to follow someone who understands the weight of the world but still leads with hope, love, joy, peace, patience in their heart. I'm not going to turn this into a discussion about the current Presidential race. Because in all honesty, I think all of the candidates have a lot more of #1 in their campaigns than they have #2. There will never be a perfect #2 candidate or politician. But there is one leader who embodies #2. A leader who sees it as a priority to care for the poor, attend to mental health issues, seek justice for the oppressed, connect to our brothers and sisters in the world. A leader who believes strongly in peace instead of war, who values women and children, who gives food to the hungry and medical care to the sick. A leader who has stood up to the regime and the historic leadership and made huge changes to how things have always been done. Do you know where the words for #1 and #2 came from? All of it came from the Bible. 19 It’s clear that our flesh entices us into practicing some of its most heinous acts: participating in corrupt sexual relationships, impurity, unbridled lust, 20 idolatry, witchcraft, hatred, arguing, jealousy, anger, selfishness, contentiousness, division, 21 envy of others’ good fortune,drunkenness, drunken revelry, and other shameful vices that plague humankind. I told you this clearly before, and I only tell you again so there is no room for confusion: those who give in to these ways will not inherit the kingdom of God. When I watch the debates and I read the articles and I hear the speeches, I also think about the Sermon on the Mount. The words that Jesus himself gave us that guide how we live and the choices we make and the impact we have on the world. Do any of the candidates meet anything at all in the Beatitudes, for example? 3 Jesus: Blessed are the spiritually poor—the kingdom of heaven is theirs. 4 Blessed are those who mourn—they will be comforted. 5 Blessed are the meek and gentle—they will inherit the earth. 6 Blessed are those who hunger and thirst for righteousness—they will be filled. 7 Blessed are the merciful—they will be shown mercy. 8 Blessed are those who are pure in heart—they will see God. 9 Blessed are the peacemakers—they will be called children of God. 10 Blessed are those who are persecuted because of righteousness—the kingdom of heaven is theirs. I can go through the candidates and clearly check off - meek? gentle? merciful? pure in heart? peacemakers? Don't make me laugh. Imagining someone seriously convinced that Trump is meek and gentle or that Cruz is a peacemaker or that Clinton thirsts for righteousness gives me serious pause. I am biased - I do "feel the Bern" and I do feel that out of what is being offered, Sanders comes closest to how my faith wants my country to be run. Do you consider your personal values when you consider electing a president, a governor, a mayor, a senator? Do you look at the priorities you have for yourself and your children, the expectations you have in your family and friends and do you apply that to the people who want to make laws and rules and policies and represent you in the world? 21 As you know, long ago God instructed Moses to tell His people, “Do not murder;[a] those who murder will be judged and punished.” 22 But here is the even harder truth: anyone who is angry with his brother will be judged for his anger. Anyone who taunts his friend, speaks contemptuously toward him, or calls him “Loser” or “Fool” or “Scum,” will have to answer to the high court. And anyone who calls his brother a fool may find himself in the fires of hell. 38 You know that Hebrew Scripture sets this standard of justice and punishment: take an eye for an eye and a tooth for a tooth. [d] 39 But I say this, don’t fight against the one who is working evil against you. If someone strikes you on the right cheek, you are to turn and offer him your left cheek. 40 If someone connives to get your shirt, give him your jacket as well. 41 If someone forces you to walk with him for a mile, walk with him for two instead. 42 If someone asks you for something, give it to him. If someone wants to borrow something from you, do not turn away. Politics and religion do not mix. Politicians are, almost by definition, the opposite of all that Jesus preached. But my faith is a priority in my life. It indicates for me how I should live, how I should care for others, how I should view the entire world. So my faith drives my interest in politics because I do wish that we could have leaders who want these things that Jesus taught. I want politicians to be fair to everyone, no matter what their faith or value system is based on. But I think leaders who seek to lead the way that Jesus did, who follow what Jesus taught, those leaders speak to my heart in a bigger way. One of my biggest struggles with motherhood is that there is never alone time. We can joke about how a mom never has a moment to herself - not even to pee or shower. Even if I am home without the kids or husband, there are piles of laundry or a sink full of dishes nagging at me. I've never understood how there can be so many outside demands of my time until I became a mom. And it doesn't get better. It just gets different. As a mom to newborns and infants, the demand is constant for life sustaining things like food and comfort and physical care. As toddlers, we add in a new level of safety demands. As my kids have grown, their demands on me and my time haven't lessened - they've just changed in nature. My day is generally jam packed with demands on my time, my energy, my abilities. There's this idea that we have to make time for ourselves. And I used to do that with exercise. But even then there is a "must" sense to it. There is an expected outcome, a sense of this being a task. Even when I sit and watch TV, I am usually doing something else at the same time. How did I become this person? How did I get to be so... worn thin? And I know I am not at all alone in feeling this way. I attended a retreat this past weekend. And it was filled the things you expect - connecting with others, self reflection, sharing, lots of laughter. But there was an hour set aside for Scripture reflection through a process called Lectio Divina. I've "studied" the idea of Lectio Divina and thought it sounded like something I'd enjoy. But I've never been able to make time for it. At this retreat, we were given the Scripture and then given an hour to find a place where we could comfortably read, reflect, meditate, contemplate. I struck out down a broad path by myself. And I was attracted to a woodsy area off the path. I had brought a blanket along so I climbed in amongst the brush and trees, laid down my blanket, and sat down. 13 For You shaped me, inside and out. 14 I will offer You my grateful heart, for I am Your unique creation, filled with wonder and awe. You established the length of my life before I ever tasted the sweetnessof it. 17 Your thoughts and plans are treasures to me, O God! I cherish each and every one of them! 18 If I could count each one of them, they would be more than all the grains of sand on earth. Their number is inconceivable! Even when I wake up, I am still near to You. I read the Psalm and then I just sat with my eyes closed. I listened to the sounds of nature around me. Birds and a woodpecker and geese - some nearby, some far away. I felt the sun on my face and saw the glow of light through my closed eyelids. I heard the sounds of a family off in the distance, children playing in their yard. I read the words again. I focused on phrases that stood out to me - mother's womb, for example. 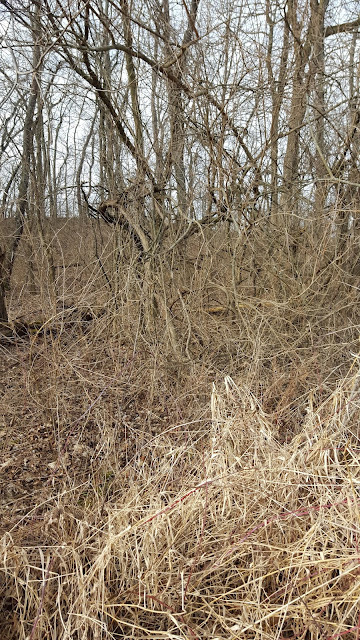 I felt like I was cradled in Mother Nature's womb, secured from obvious sight, hidden in a tangle of branches. I wanted to write. I began to jot down thoughts and impressions on the paper that carried the Scripture. I sat still in my spot and listened but with my eyes open. 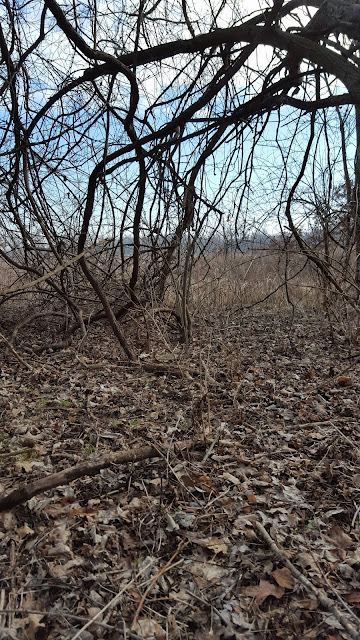 The blue sky, the white clouds, the wild field on the other side of the path that will soon begin to burst alive with new growth, the tree branches that will form buds and grow new leaves. I realized that I needed to check the time because we had an hour for the activity and then had to meet back together in the lodge. It had been about 30 minutes. I had been sitting still and quietly with no demands on my time for 30 minutes. I was surprised but then I did a little self assessment. I didn't feel... bored or restless or anxious. I felt calm and relaxed and peaceful. Moreso than I have felt in a very long time. I had brought markers with me and spent 15 minutes sitting in my little womb and just colored. My mind was clear. My heart was peaceful. I think that's the closest I've gotten to the idea of "zen." Not the actual Buddhist practice of Zen but the common idea of a sense of zen. When it was time to return to the lodge, I stood and stretched as best I could from within my nest. I picked up my blanket and carefully made my way back to the path. I stretched again - more fully this time. Over the past 2 days since the retreat, I keep going back to that time in the trees. Those 45 minutes of quiet, of being alone, of no demands, of my mind not wandering to the list of "to do's" waiting for me. The calm, the peace, the awareness of life. And now I have a longing for more of this experience. An awareness that this isn't something I should schedule or make into an expected task to check off my list. But maybe, when life is feeling hard and overwhelming and stressful... maybe I need to go find a womb, a nest. A place where I can sit and connect to the earth and the air. Where I can be silent and still and simply exist in God's presence.